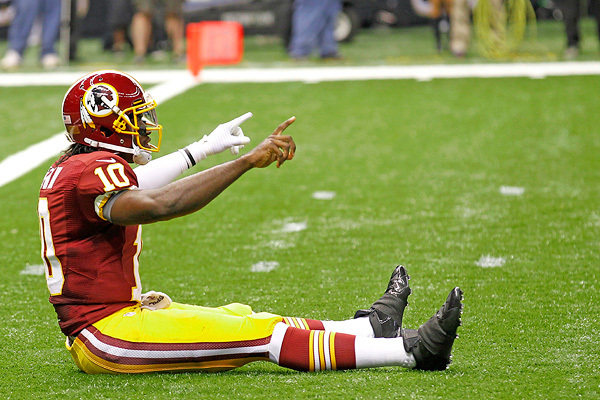 And so begins the (perhaps logical) ending to this blog’s “RG3 Cycle” that has been written this season (and my second Wagner reference in two posts). Over the past calendar year, I’ve dedicated a couple thousand words to chronicling the birth, ascent, and controversy surrounding a sports phenomenon here in DC the likes of which I’ve never seen before. Since then, Robert Griffin III has risen from being the draft’s silver medal in a crop full of starting rookie QBs to being the leading jersey seller in the league and a legitimate star recognizable across the sport and beyond. He’s become one of the crown jewels of Black America, a Black QB who can throw it better than most AND run it better than most, and has become the figurehead for all Washington sports (one of the most Black-concentrated sports markets in the country). On top of all that, he also had a hell of a season, leading the Redskins on an improbable late season streak that landed them in their first home playoff game in 13 years. He was worth the hype and more, and even with a late season injury that limited him and his team, and the Redskins probably not having the firepower to make it deep into the playoffs, his stardom and legend seemed to be on an unrelenting ascent. Then it happened. Griffin, having earlier re-injured his already gimpy knee, buckled on a botched snap and we all knew it was curtains for his season and for the Redskins’ playoff run. The Redskins current season was ended and their hopes for the next were seriously curtailed as it has since been determined that he suffered serious injury to multiple knee ligaments and will require a second knee reconstructive surgery, one with a rehabilitation process that could last for the greater part of a calendar year. We don’t quite know how badly this will impact Griffin’s career or the 2013-2014 Redskins season, as these surgeries are more and more effective (shown by Adrian Peterson’s absolute dominance), and as Griffin has himself come back at full strength from a previous knee surgery; but it’s always a dice roll, and it will, at the very least, stunt his development. The worst-case scenario is that the explosive, quick-thinking and quick-throwing athlete we saw burn up the field this year might never come back in the same way. As is the case with most sports drama, the blame game began almost immediately after we saw the play. The initial reaction from most folks seemed to be that the Redskins coaching staff and its head coach Mike Shanahan acted recklessly and did not take RG3’s safety seriously. I myself wanted the Shanahans fired for the stupidity in playing Griffin after his knee first buckled and for continuing calling running plays even after RG3 began noticeably limping. I still do. But then as the dust settled, more and more people pointed out the difficult spot the coach is in when an icon wants to play. The same people who used master/slave analogies for Shanahan and Griffin after the injury would have done so if Shanahan had limited or pulled his star quarterback. As Jason Whitlock of Fox Sports writes, Robert Griffin’s hubris and his determination to play even after he was hurt and ineffective are to blame as well. The hype and the expectations around Griffin held him and Shanahan hostage, especially if Griffin were pulled and the Redskins had lost. Griffin saw himself as a Willis Reed type willing himself and his team to victory and felt beholden to the massive burden of fan expectations. Shanahan found himself answering to his quarterback’s will and to the expectations of the fan base (and to an extent the larger Black community rooting for Griffin). Both found out that these expectations can have tragic results, and that you can’t always will yourself to legendary sports victories. If Shanahan and RG3 are partners in crime in this sports tragedy, then the obvious third culprit is us, the fans. Redskins fans; Black America; people who boosted a young quarterback to legend status so quickly; Me. I’m not saying that had there been absolutely no pressure on the Skins and the QB that the injury would have been avoided, but our efforts to create a John Henry out of a 22-year-old kid had certainly added to the situation and have complicated our assessment of it. To an extent, every athlete is subject to the public’s unrealistic demands of his body and mind (see Lebron James), but it seems, at times, like Griffin had even loftier expectations than Lebron. Like white boxing enthusiasts in the time of Jack Johnson, we’ve been looking for a Great [Black] Hope QB, one that can throw it as well as the White boys, has all the intangibles, can run it well, and will end up in the Hall of Fame. Most Black QBs have fallen short of the ideal or have had ignoble ends to promising careers. Much of the praise levied towards Griffin involves his perception as That Guy. He had the high-profile entry into the league and the superstardom to match. He has the arm and the brain, and a certain social grace that seems to elude certain others with similar talent (see Vick, McNabb). While similar things can be said of fellow Russell Wilson, Griffin’s success seems even more proprietary to “us” because of the market and team he plays for, an effect that echoes what happened to Michael Vick in Atlanta and Donovan McNabb in Philadelphia, who eventually had their legacies collapse under the expectations of demanding fans and racial politics. This is why we have multiple pundits opining about whether he’s “Black enough” or whether he represents the Black race, etc. These dynamics could have played a role in both the coach’s decision and player hubris that led to Griffin’s literal collapse. Even if these issues didn’t play a role in the actual injury, they certainly will shape how we view RG3 during his eventual (hopefully very successful) comeback and long career. The expectations probably won’t change, but hopefully the bounty of young Black starting quarterbacks now in the NFL will take some of the individual pressure from Griffin. I just feel like the injury, along with the firestorm of blame afterwards, partially serves as a warning to us (to me) to temper our expectations and allow this career to play out on Griffin’s terms, instead of ours. We can have great hopes for the guy, but must remember that his destiny and desires are his own and do not belong to us. Let’s just hope we get to watch him fully healthy in 2013-2014.